Nord Lead 4 Keyboard 49 keys, 20 voice, 4 outs. 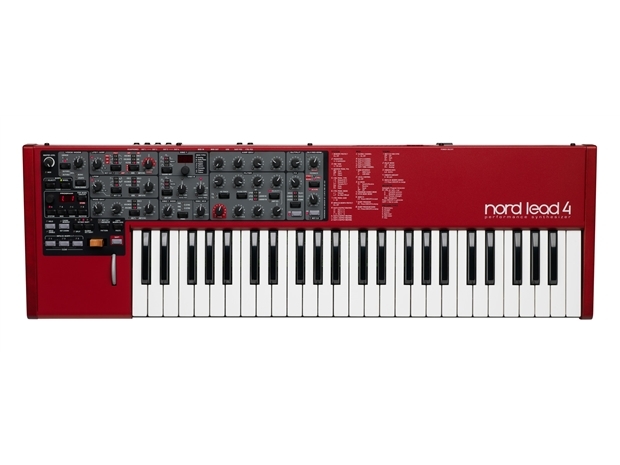 Nord Lead 4 is a 4-part multi-timbral synthesizer sporting a brand new 2-oscillator virtual analog sound engine with 2x oversampling. In addition to the classic analog waveforms there’s a Wavetable mode with unique new Formant Wavetables. Frequency Modulation and Hard/Soft sync options are available for mutilating your sound further and the True Voice Unison mode can stack up to four oscillators per voice for really thick, beefy leads and pads. The filter section boasts Low Pass (12/24dB), High Pass, and Band Pass filters and also stunning new simulations of two transistor and diode ladder filters capturing the squeaky, dirty character of the originals. A dedicated filter overdrive can distort your sound before it passes through the effect section. The new Variation buttons let you override almost any parameter of the synthesizer, instantaneously. Ever wanted to change LFO speed, Modulation routings and reverb amount - all at once, in the middle of a sound? With the Nord Lead 4 you can! With 7 assignable variations per program Nord Lead 4 gives you creative freedom to warp and improvise your sound live, both rhythmically and sonically and thanks to the Master Clock Synchronization, it can be done in perfect sync to other layers or an external MIDI Clock. All 4 slots have dedicated effect sections with delay, reverb, tube amp simulated overdrive, a Talk effect modeled after a vocal tract and a sample rate reducing Crush effect. 4-part multi-timbral with 4 separate outs. 2-Oscillator Virtual Analog Subtractive synthesis with Frequency Modulation, Hard and Soft Sync and True Voice Unison. Morph and Variation performance controls. Wavetable synthesis, including unique Formant Wavetables. 12/24 dB Low-pass, High-pass, Band-pass filters section plus transistor and diode ladder filter simulations. 2 LFO/Arpeggiator sections and Mod Env section with flexible routing possibilities. LFO, Arpeggiator and Delay can be synchronized to the Master Clock (or external MIDI-Clock). Nord Sound Manager-compatible for program management. Nord : Nord Lead 4 Keyboard 49 keys, 20 voice, 4 outs.